Principal investigators: Gabriele Ferrari, Giacomo Lamporesi. Postdoc: Giacomo Colzi, Dimitrios Trypogeorgos. PhD students: Carmelo Mordini, Matteo Barbiero, Arturo Farolfi, Louise Wolswijk. Giacomo Colzi (2018)	"A new apparatus to simulate fundamental interactions with ultracold atoms". Eleonora Fava (2018)	"Static and dynamics properties of a miscible two-component Bose-Einstein condensate". Simone Serafini (2017)	"Dynamics of Vortices and their Interactions in Bose-Einstein Condensates". Simone Donadello (2016)	"Observation of the Kibble-Zurek mechanism in a bosonic gas". Axially symmetric elongated traps allow transverse vortices to approach with random relative velocity and orientation, differently from what happens in flat traps or in rotating condensates. We observe in real time the vortex filament orientation and position in the condensate and study different interaction mechanisms that occur depending on their approaching velocities and relative orientation. Two orthogonal vortices approach and may bounce without touching (if their relative velocity is small enough) or touch and reconnect exchanging their tails (for large relative velocities). Single vortices in elongated condensates are mainly oriented along a radial direction and tend to move on elliptical orbits around the center. We track their dynamics by performing a real-time weakly destructive imaging. The measured period verifies the predicted dependence on the local chemical potential. Whenever vortices do not lie on a radial plane but are slightly tilted, they experience a torque that forces them to precess around the long symmetry axis of the trap to conserve the angular momentum along such axis. arXiv:1705.09102, Phys. Rev. A 96, 053605 (2017) (see also Synopsis in Physics) Tilted vortices orbiting around the trap center and spinning about the trap axis. The geometrical properties of a system have an influence on the nature of defects that can be supported. 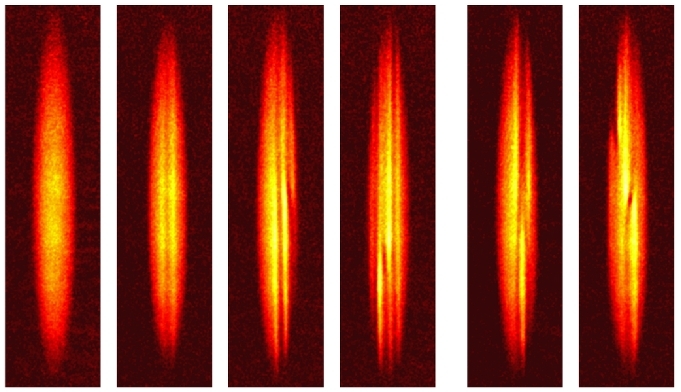 Besides common solitons in quasi 1D systems and vortices in round pancake like condensates, we observed solitonic vortices in elongated samples. These hybrid defects are vortices aligned along a short axis with a 2pi phase winding, but also show a planar density depletion in the radial plane containing the vortex. 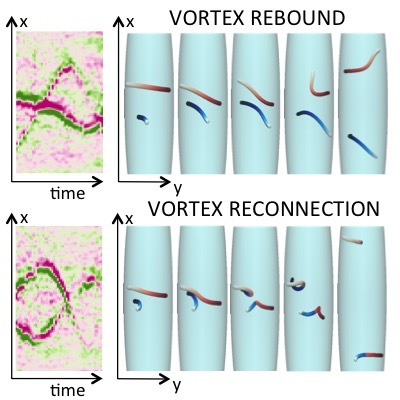 Tri-axial absorption imaging of elongated BECs after a long time of flight providing clear signatures of the presence of solitonic vortices with opposite circulation. Quantum criticalities are mechanisms driving disparate phenomena ranging from the origin of our universe to the appearance of defects in uniform systems. 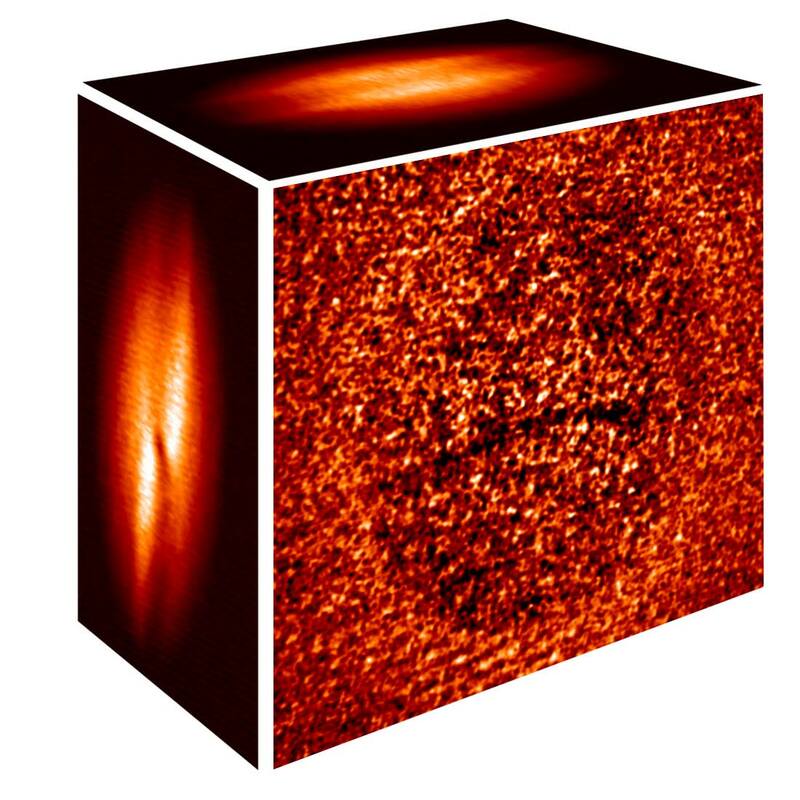 We use ultracold atoms at the BEC transition to explore the Kibble-Zurek mechanism by directly observing the creation of phase defects in the order parameter of a Bose-Einstein condensate for temperature quenched BECs of sodium atoms. A condensate of Sodium atoms is formed by quenching the temperature across the BEC phase transition. If the quench is fast, defects appear in the order parameter due to the Kibble-Zurek mechanism. A slowly rotating binary BEC might have a vortex in each component that orbits around the trap center. In presence of a coherent coupling, the two vortices lock at a precise distance given by the intercomponent interaction strength. The force between such vortices is strongly analogous to the force that confines quarks. If an external force tries to separate the two beyond their equilibrium distance then a new pair of vortices is created. We aim to observe such phenomenon using a sodium two-component BEC in collaboration with TIFPA-INFN under the project FISħ. A mixture of Na atoms in the mF=1 and mF=-1 of the F=1 hyperfine state is a fully miscible mixture and thanks to the intrinsic perfect symmetry it does not show buoyancy when held in a harmonic confinement, differently from any other binary BEC studied in cold atoms. This mixture is close to the miscible/immiscible phase transition. Thanks to these nice features we are able to observe spin-dipole oscillations in the linear regime with a frequency about 5 times smaller than the trap frequency. We also measure the strong static polarizability, with an enhancement of a factor 20 in the equilibrium relative displacement of the centers of mass. These strong effects on the spin-dipole frequency and on the spin-dipole polarizability are confirmed by the theoretical predictions for a mixture near the miscible/immiscible transition. In the presence of a large thermal component the spin polarizability is even increased. At finite temperature we investigate the nontrivial dynamics of the four fluids composing the mixture and observe different behaviors for different collisional regimes. In particular, in the collisional regime the thermal components quickly damp their relative motion while the two BECs continue oscillating with negligible damping, a clear signature of spin superfluidity. Static polarizability: (left) Measured enhanced displacement of the relative centers of mass as a function of the trap minima separation. (right) Spin-dipole oscillation observed after time of flight for different trap separations. 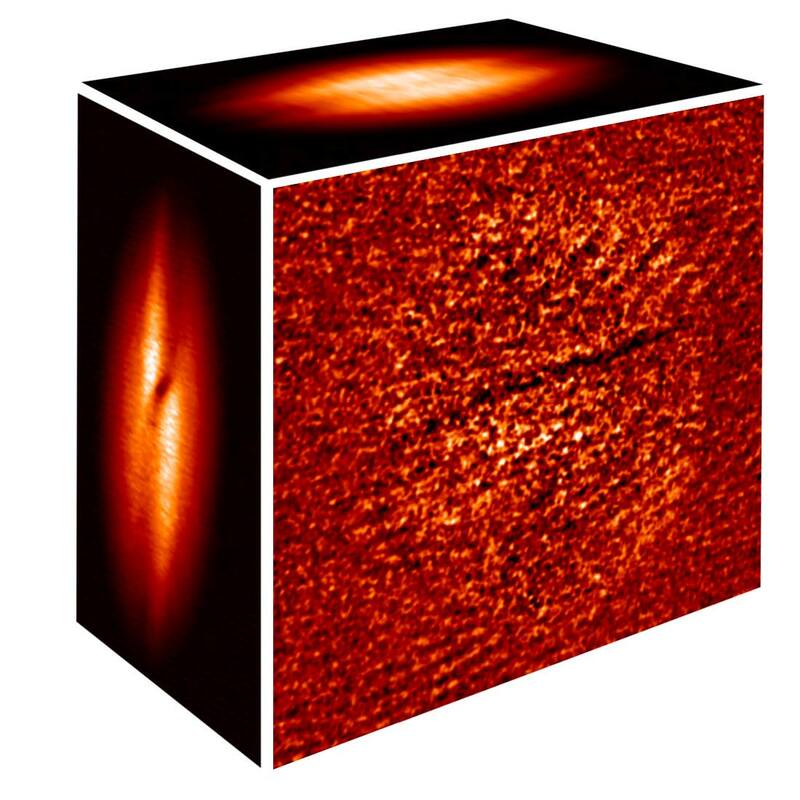 We produce large 23Na Bose-Einstein condensates in a hybrid trap characterized by a weak magnetic field quadrupole and a tightly focused infrared beam. The use of small magnetic field gradients makes the trap compatible with the state-of-the-art magnetic shields. By taking advantage of the deep cooling and high efficiency of gray molasses to improve the initial trap loading conditions, we produce condensates composed of as much as 7 million atoms in less than 30s. We implemented a gray molasses cooling technique on a sodium precooled sample by using blue-detuned light on the D1 transition. Starting from a gas of 3x109 atoms at 350 microK our gray molasses stage allows to obtain a more degenerate sample containing 2x109 atoms at 9 microK. The final PSD is 10-4, one order of magnitude higher than the best we obtained with a molasses stage using the D2 transition. We realized a novel, multi-species, compact cold atomic source. Permanent magnets are used to create a 2D quadrupole magnetic field for a 2D-MOT. Their residual field in combination with a vertical laser beam form a compact Zeeman slower that enhances the number of trappable atoms. Eventually cooled atoms are pushed along the 2D-MOT axis towards a 3D-MOT cleaner chamber. This geometry also avoids hot atoms from the source to directly reach the 3D-MOT. Scheme of the multi-species compact cold atom source. A new source of cold atomic strontium is currently being developed in our lab in collaboration with INRIM (Turin) for the realization of an optical clock to be used as a frequency and time reference.